This is designed to help with chord formations. You can input chords by simply clicking the keyboard display, MIDI learn or by picking the intervals/note names. Chord shapes and keyboard mappings can be saved/loaded as simple text files, displayed in menus on the plugin GUI. Copy/Paste chords to other trigger notes. 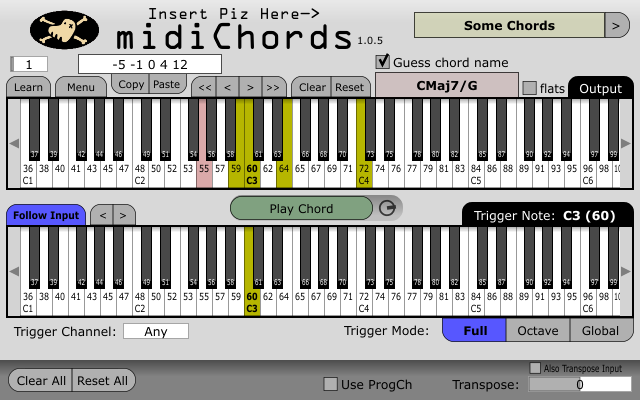 Supports multichannel chords: each chord note can be output to any combination of MIDI channels. Applies input velocity to the output chord. Output can be transposed for playing in other keys. Set one chord per MIDI note for 128 different chords (Full mode). Use Octave mode to repeat the same 12 chords in every octave. Global mode transposes one chord across the whole input range. Has 128 internal programs with optional MIDI program change listening. Imports Cubase/Nuendo Chorder .xml presets. Various other minor usability improvements.